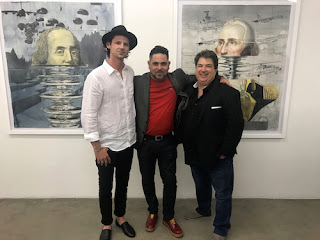 Both Gallery's Opening Reception with owner Bryant Toth and Artist Alain Pino. It has taken us a while to make the formal introduction/announcement that Rocco LoConte has joined the Jerry’s Artist Outlet family, as Manager of our Custom Framing & Design Studio. Rocco has been part of the Jerry’s family for quite a few months and many of you may have had the pleasure of working with him. His reputation as a Custom Framer and Restoration Artist is stellar. Rocco’s framing experience is celebrated in both private and corporate endeavors and he has greatly expanded credentials and services to Jerry’s Award Winning Frame Shop. Now, Jerry’s can offer museum quality restoration of your art, in house, at a fair price and with superior results. Having run successful businesses for himself and others in the past, we were thrilled when he agreed to join our team. Rocco is a Jersey Boy, with roots in our community and friends and customers all over the world. His talent and personality is much appreciated here at Jerry’s by coworkers and customers alike. The seamless way that he and Peter have worked together to expand and raise the level of expertise in our Custom Framing Studio is admirable. We welcome Rocco LoConte to the Jerry’s Artist Outlet family and we encourage you to come in and check out Northern New Jersey’s Premiere Framing & Design Studio at Jerry’s Artist Outlet.